Moremi Game Reserve is surrounded by wildlife management areas and private concessions of the Okavango, with no boundaries between the concessions and the reserve allowing wildlife to move freely between the woodlands in the wet season when water is plentiful and back to permanent rivers and lagoons in the dry season. The Khwai area is managed by the Khwai community through the Khwai Development Trust. This area offers the same wildlife experience as the reserve itself. However, a key advantage of being in this private concession is the freedom to do walking safaris and night drives. Maun is the starting point for most expeditions into the Okavango Delta and as a result, has developed into a bustling metropolis that is considered Botswana’s tourism capital. Area attractions include a renowned river boat that offers ‘booze cruises’ up and down the Thamalakane River, and the forest groves of the Maun Game Reserve. The Central Kalahari Game Reserve is the largest national park in Botswana; centrally situated in the country it is often referred to as the “heart of Botswana”. The Kalahari’s wide open spaces, intense solitude and rolling dunes that are well vegetated with grass and scrub make it a unique African holiday destination. Dinaka borders the northern part of the Central Kalahari Game-Reserve, and this is where we spend the first two nights of our tour. All prices are subject to availability Prices are based on exchange rates at time of publication. Prices may vary at the time of booking. Prices may incur a credit card surcharge and booking fee. You can extend your stay or combine it with another at this destination or a different one (on request). Day 2 : Exploring Day Day spentexploring this private concession on game drives in the morning and night and experiencing in the afternoon a nature walk with the local bushman to learn about their anchestral surviving skills. Situated in the heart of Botswana – the Central Kalahari Desert – Dinaka offers an explosion of colourful birdlife, herds of graceful antelope, and prides of Africa’s fiercest predators – amongst them the Kalahari black-maned lion. There will also be an opportunity to spend time with local bushman people, who are proud to show you their ancient survival skills, ranging from shelters, hunting techniques , tracking and all important fire making. Dinaka Safari Lodge is situated on a 20 000 hectare private game ranch on the northern boundary of the Central Kalahari Game Reserve. It is centered around the permanent waterhole we created, making it as beautiful as it is remote. A small lodge of only 6 tents, Dinaka Safari Lodge is able to provide you with real home comforts without losing its authentic bush feel. Each tent is a private hideaway, nestled under the branches of the ‘Purple Pod’ trees; they blend in with the natural surroundings. All tents have an en-suite bathroom, with an open air shower and flushing toilet, along with a dressing area, and a bedroom with large white linen covered beds (king size or 2 singles). At the entrance to each tent is a covered veranda that overlooks the permanent waterhole we created – a perfect spot to relax after a day of new sights and sounds. The spacious main lodge is furnished with comfort in mind and provides you with lounges, both a dining and bar area, and a splash pool for those hotter months. To minimize any effects on the pristine natural environment the camp is 100% solar operated. Game drives – Both during the day and at night. Watch the vast landscape transform as the sun sets and darkness settles in over the bush revealing new creatures and night-calls. Nature walks with Bushmen trackers –Learn from, or simply enjoy being in the presence of someone who is as much a part of the African bush as the sand you walk on or the sky you walk under. Stargazing – The night sky is a diamond studded wonder. Astronomy courses can be provided by special arrangement. Sundowners on a raised hide overlooking a waterhole – With a drink of your own, watch a myriad of animals quench their thirst after a long day in the African sun. Birding safaris – with over 200 positively identified bird species, the central Kalahari truly is a birders paradise. During your stay at Dinaka, you can expect to see a wide array of animals, from the antelope – eland, kudu, gemsbok, impala, springbok and steenbok – to the reptiles, insects, birds and small mammals like the Honey Badger and porcupine – to the predators – the Kalahari lion, cheetah, leopard and brown hyenas. You will enjoy the next couple of days exploring the Kalahari Game Reserve with our days consisting of early morning and late afternoon game drives in search of various predators (such as lion, leopard, cheetah, wild dog, hyaena) antelope (such as springbock, gemsbok, red heartbeest,..) and other game such as giraffe, zebra, etc and of course also the birds that inhabit this area. Upon return to your campsite around late morning, a delicious brunch will be served. Thereafter you have time to relax in/around camp. You will explore this area in great detail, which is sure to provide many unforgettable game-viewing experiences. The concept of adventure camping in comfort and safety. These safaris have been designed in such a way as to ensure maximum comfort and respond to the demand for freedom and security for any adventurous travelers who prefers a semi luxurious, but still adventurous, African style product. In our camps we set up large tents of 4.5 m x 3m, which have en-suite bathrooms and a partition between the bedroom and private bathroom interior. The tents have large windows with mosquito gauze. In the bathroom there is a chemical toilet and a hot bucket shower, ensuring that you do not need to exit the security of the tent at night. Further to this there is also a small linen closet with shelves, a mirror and containers for soap, toothbrushes, toothpaste, brush, comb …. We provide towels and amenities such as soap, shampoo and insect repellent. We also provide high-density mattresses, pillows, quilts, sheets, and during the winter, blankets and hot water bottle. Between the beds there is a small table with a light and rechargeable battery. At the entrance of the tent there is a water container which is filled by our staff every morning and evening to wash your hands and face and clean your teeth. The camp is set up with a mess tent, which includes a dining table and buffet table, and a coffee station which is available all day. The table for lunch and dinner is prepared by our camp staff with porcelain plates, glasses for water and wine, and metal cutlery. The meals are prepared by our brilliant bush chefs on the fire and our menus include a variety of foods, including chicken, beef, pork and lamb, pasta, rice, potatoes, cooked and raw vegetables and fruits in season. Daily, our chefs prepare fresh bread and cakes for dessert and surprise birthday celebrations. These safaris are organized with a minimum of 2 vehicles: one vehicle for passengers and the local professional guide, and a back-up vehicle for equipment, supplies and camp staff. The back-up vehicle departs before our clients, providing them with the required time to prepare the camp and meals before the clients arrive, where possible. Our staff efficiently ensure the cleanliness and order of the camp and the tents at all times, and they take down and reset the camp when you move from one place to another. In this way, our clients can relax when in camp and spend more time in search of animals and observing the flora and wild places of Botswana. After an early breakfast we return to Maun for one night after a big return journey out of the Kalahari. Afternoon at leisure around the swimming pool, or just reading a book. Relaxed evening dinner. Thamalakane River Lodge is ideally located an easy 20-minute drive from Maun Airport en route to the famous Moremi Game Reserve. It is a secluded haven of tranquility nestled in a grove of mature riverine trees on the bank of the Thamalakane River. The rambling lodge has an idyllic setting and is committed to service excellence. Character en-suite stone chalets, some with private splash pools are positioned in the shade of the riverine forest, overlooking the river. All chalets and common areas have terraces that take advantage of the serene 180 degree view of the riverbanks lined with fluttering reeds visited by an ever changing array of water fowl and birds. The newly added Firefinch Camp consists of 8 en suite Meru tents offering a more traditional safari accommodation experience. It is a delightful place to come home to after a day spent exploring. You will have short final opportunity to purchase any final things, before departing Maun for our destination – Moremi Area – situated in the eastern part of the Okavango Delta. This game reserve is ideally situated for a wildlife sanctuary. It has no fences, hence allowing unobstructed seasonal movement of game which makes this a largely natural area. This is a paradise for birds, game and predators alike. Completely varied vegetation makes this area very special. Within an hours’ travelling it is possible to view the first of the wildlife inhabiting this area. We will stop en-route for a simple lunch of sandwiches and fruit, before continuing towards our camp. Late afternoon arrival at your camp, with enough time to settle in before having our evening meal. Afterwards we will relax around the campfire, where your guide will explain some detail regarding your new area. There are a number of new animal and bird species that will be on our priority list for the coming days. You will explore the Moremi Delta area intimately with our days consisting of early morning and late afternoon game drives in search of various predators (such as lion, leopard, cheetah, wild dog, hyaena) antelope (such as impala, lechwe, reedbuck, tsessebe) and other game such as giraffe, zebra, etc and of course also the birds that inhabit this area. Hippopotamus are abundant in the streams and lagoons that make up vast areas of the Delta. Upon return to our campsite around late morning, a delicious brunch will be served. Thereafter you have time to relax in/around camp.This region is sure to provide many unforgettable game-viewing experiences. After an early breakfast, we have our final game-drive en route to Maun from where we depart for Johannesburg to connect with your outbound International flights or continuation of your tour. Vehicles (Toyota Land Cruiser 4 x 4) equipped with a hydraulic lift. 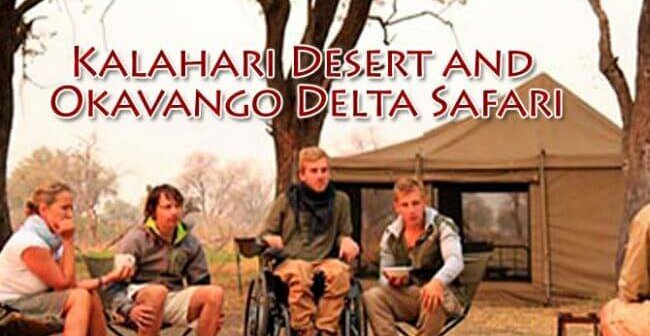 Hey Buddy!, I found this information for you: "Kalahari Desert and Okavango Delta Safari". 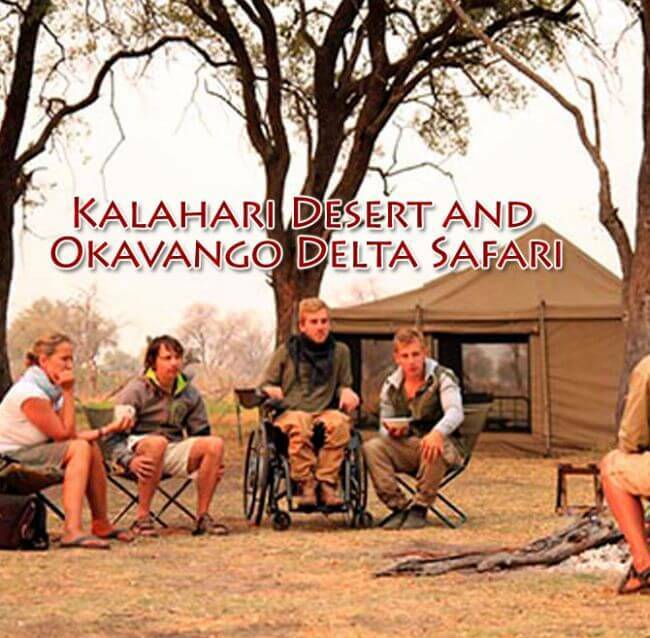 Here is the website link: https://pushliving.com/kalahari-desert-and-okavango-delta-safari/. Thank you.